Make activities and food – not alcohol- the focus of your party. 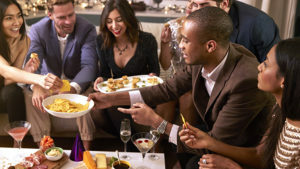 Planning a party can be a big task, especially when you consider your responsibilities as host extend beyond when your guests walk out the door. The perfect ending to any gathering is a safe trip home for all of your guests. Remember, too, if your intoxicated guest is injured or injures someone else on the way home, you could be held legally responsible. But you can take steps to ensure the safety of your guests and, ultimately, the success of your gathering. This loss control information is advisory only, and reprinted with permission from Cincinnati Insurance Companies. The author assumes no responsibility for management or control of loss control activities. Not all exposures are identified in this article. Contact Bolder Insurance for coverage advice and policy service.